Canada is rejecting a Palestinian effort to win recognition at the United Nations as an independent state. The move is not surprising given that the Harper government has forcefully highlighted its loyalty to Israel and the United States. Both oppose the Palestinian initiative. The Palestinian Authority, which controls most of the West Bank, launched a campaign last month that will see it pursue a vote on statehood at the United Nations General Assembly in September — an effort borne out of its frustration over a peace process that is stalled. The top Palestinian diplomat in Canada says her official delegation will still push hard for the support of Ottawa. "On the conflict, we would like to see the Canadian government taking a neutral stand, supporting the creation of the state of Palestine, supporting the recognition of Palestine as a full member state in the UN in September," Linda Sobeh Ali, head of the Palestinian delegation, told The Canadian Press. Sobeh Ali also said her delegation is pushing Canada to recognize Israel's pre-1967 borders — something Prime Minister Stephen Harper forcefully opposed, and managed to block from being part of the final communique of G8 leaders at their recent May summit in France. "Our government's long-standing position has not changed. The only solution to this conflict is one negotiated between and agreed to by the two parties," said Chris Day, the spokesman for Foreign Affairs Minister John Baird. "One of the states must be a Jewish state and recognized as such, while the Palestinian state is to be a non-militarized one." The Palestinians are trying to win the requisite two-thirds support in the assembly — 128 votes among the 192 member countries — before the matter is considered by the Security Council. They have reportedly won the support of more than 100 countries. 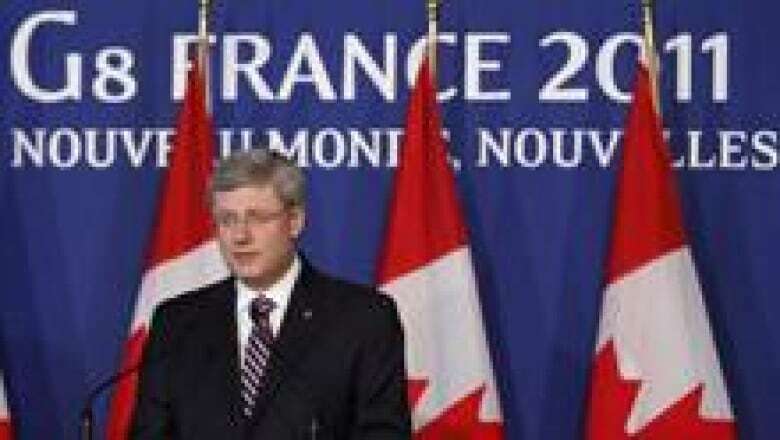 Prime Minister Stephen Harper confirmed that Canada had objected to any language in the final communiqué that included mention of Israel's pre-1967 borders at the G8 meeting in Deauville, France, May, 2011. (Markus Schreiber/Associated Press)Harper's stand at the G8 pitted him against U.S. President Barack Obama, who only a week earlier said in a major speech that the pre-1967 border should be a starting point for the resumption of stalled peace talks between the Israelis and Palestinians. But Washington last week reiterated its opposition to the Palestinian push for UN recognition of its statehood. A State Department spokeswoman said the Palestinian move would not be helpful to getting the parties back to the bargaining table. We will monitor developments at the UN and respond appropriately," said Day. "As G8 leaders declared at Deauville, unilateral action is ultimately unhelpful." U.S. Secretary of State Hillary Clinton is to host a meeting Monday of the UN Secretary General, the European Union and Russian foreign ministers — the so-called "quartet" of Middle East peacemakers. The Harper government has been widely criticized for siding slavishly with Israel and turning a blind eye to the suffering of Palestinian people. Rami Khouri, a leading Mideast analyst based in Lebanon, said in a recent interview that Canada has been traditionally viewed in the region as a country that has had a "sense of decency and fairness in its foreign policy." But that can be compromised, he added, by siding too much with Israel. "I think the critical point for any Western government — Canadian, American, British — is to differentiate between supporting the security of Israel and opposing the colonization polices of Israel. 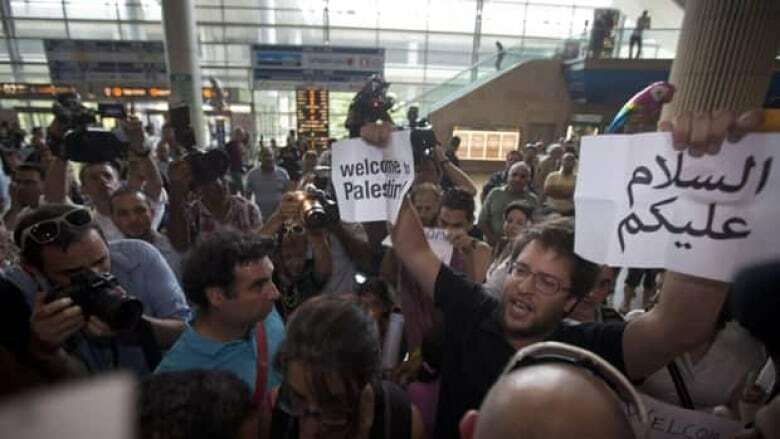 Israel within its 1967 borders is a phenomenon the world accepts, even the Arabs," Khouri said. "Any real friend of Israel should tell Israel, `we support you, your security but we don't support what you're doing'." Leaked Israeli diplomatic cables, obtained by the newspaper Haaretz, give details about its foreign ministry's diplomatic offensive to counter the Palestinian UN campaign. Israel's marching orders to its embassies are to lobby politicians, and use Jewish groups and the local media to make its case. "The goal is to get the country in which you serve to vote against recognizing a Palestinian state," said the memo given to Haaretz. "Your plan must include approaching the most senior politicians, mobilizing the relevant force multipliers (such as local Jewish communities, non-governmental organizations) using the media, influencing local public opinion, and public diplomacy aimed at all relevant communities." P&P PODCAST: Is the UN still relevant?